Several evaluations of black and white wealth in America have surfaced over the past several months. Some such as the National Urban League's "State of Black of America" have used compiled data to create indexes. Others, like that of the Pew Research Center have used median net worth to show black families in whole are worth far less than white families. Yet, these tools only tell part of the economic story. To truly understand the difference in economic access, you must look at the top of American wealth, and be honest about what you find. In total, there are just about 120 million American households. So when we talk about the top one percent, we are looking at the top 1.2 million households. Breaking the 120 million homes down by race, according to the U.S. Census, there are nearly 83 million white households, and there are just about 14 million black households. Here is where the economic picture gets clearer. A few years ago when economic inequality was just becoming a national topic, theGrio supported by MSNBC, wrote a piece titled "Who are the Black 1%". In this article, they showed that nearly 96.1 percent of the 1.2 million households in the top one percent by income were white, a total of about 1,150,000 households. In addition, these families were found to have a median net asset worth of $8.3 million dollars. In stark contrast, in the same piece black households were shown as a mere 1.4 percent of the top one percent by income, that's only 16,800 homes. In addition, their median net asset worth was just $1.2 million dollars. Using this data as an indicator only several thousand of the over 14 million African American households have more than $1.2 million dollars in net assets. "The major sources of wealth for most of the super rich are inheritances and in life transfers. The big reason is racial differences in access to resources to transfer to the next generation." Darity added that the practices of enslavement, violence, Jim Crow, discrimination and dispossession of property have kept generations of African Americans from accruing the type of wealth that whites in the top 1 percent have today. donate to Colleges and Universities affecting admissions to higher education. If this group is nearly all white, it leads to much the same demographic for the advantaged economic tiers below the top one percent. This group disseminates the access to opportunity for the rest of society across all industries. 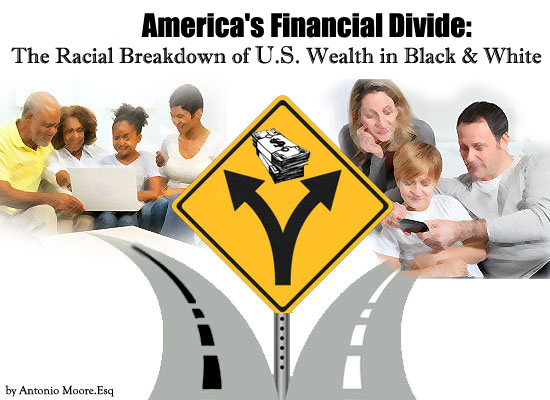 Relying on data from Credit Suisse and Brandeis University's Institute on Assets and Social Policy, the Harvard Business Review in the article "How America's Wealthiest Black Families Invest Money" recently took the analysis above a step further. In the piece the author stated "If you're white and have a net worth of about $356,000 dollars, that's good enough to put you in the 72nd percentile of white families. If you're black, it's good enough to catapult you into the 95th percentile." This means 28 percent of the total 83 million white homes, or over 23 million white households, have more than $356,000 dollars in net assets. While only 700,000 of the 14 million black homes have more than $356,000 dollars in total net worth. Matt Bruenig of Demos.org summed it up in the piece "The Top 10 percent of White Families Own Almost Everything" stating "White families hold 90 percent of the national wealth. Hispanic families hold 2.3 percent of the national wealth. 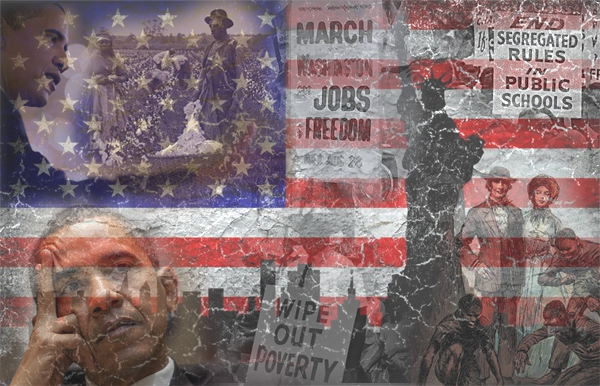 Black families hold 2.6 percent of the national wealth." So despite a display of what I have termed the "Decadent Veil", where a small group of wealthy black entertainers are shown repetitively in media. We can see Bruenig's assertion in clear application when looking at Black America with a closer lens. According to the Slate.com article "The Wealth Gap Between Blacks and Whites is Even More Enormous Than You Think", the median white family has a net worth of $116,000 dollars. 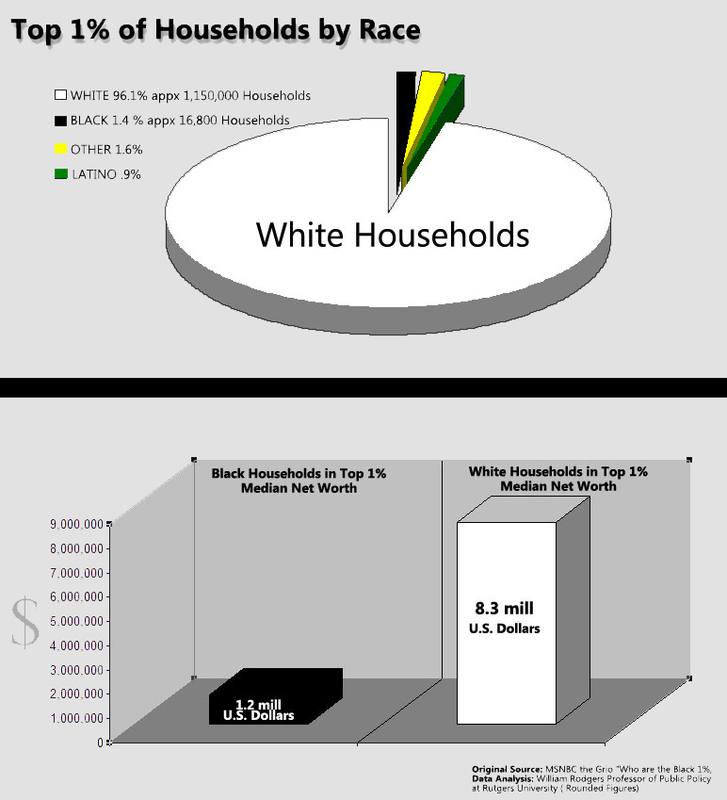 This indicates 41 million white households across the nation have over $116,000 dollars in net worth. In comparison, nearly 40 percent or 5.6 million African American homes in the U.S. have zero or negative net worth. In addition, when you deduct the family car as an asset, the median black family in America only has a net worth of $1,700 dollars. This tells a story of access and opportunity and the lasting effect of a history ripe with dissemination of advantage based on color. If nearly all of the American wealth is in white households, how do we ever expect to achieve access for all? "I've been consistent in saying that, you know, this is a legacy of a troubled racial past, of Jim Crow and slavery. That's not an excuse for black folks, and I think the overall majority of black people understand it's not an excuse. They're working hard. They're out there hustling and trying to get an education, trying to send their kids to college, but they're starting behind oftentimes in the race." CORRECTION: An earlier version of this post included a specific number of African American households that have more than $1.2 million dollars in net assets. This estimate has since been updated.